Previously available only on Materials, we now have released full Inventory Adjustments for Projects as well as of this week. You will now find a new tab called “Inventory” that shows a log of all changes made to the project’s quantity on hand from the moment it was first added to Craftybase. All quantity adjustments triggered by either a manufacture or a new order will now create a corresponding Inventory Adjustment log automatically showing how much and when the action decreased or increased your quantity on hand. 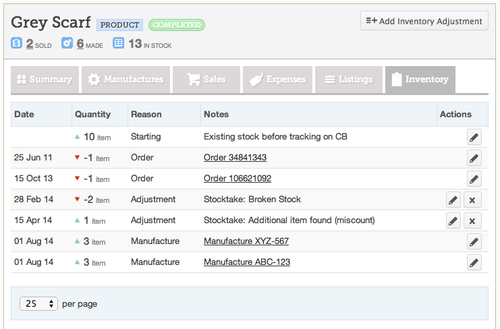 Like Materials, we have also created a way to create your own manual inventory adjustments in the system to handle discrepancies that arise from product stock loss (like breakages) or to handle existing stock on hand before you started to keep records. These adjustments can now be quickly and easily added at any time in order to ensure your stock on hand is always up to date.